Pat Jansen as Vera and Leeni Mitchell as Nana in Nana’s Naughty Knickers. Looking for a night of laughs and fast paced antics? 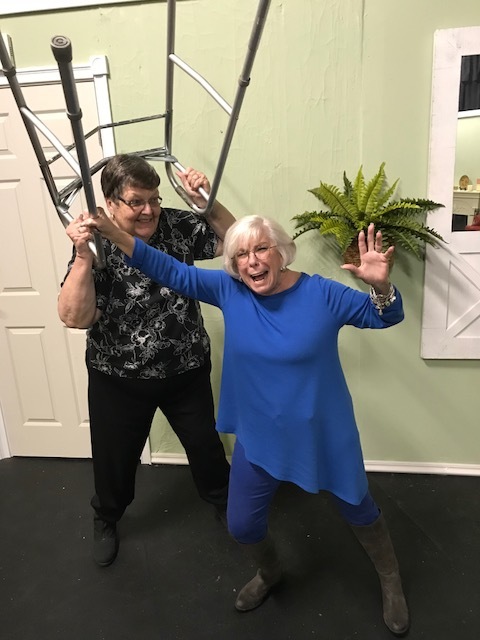 Then the Visalia Players’ production of Nana’s Naughty Knickers which opens at the Ice House on Friday, April 13 is just the ticket! Imagine you are an aspiring law student planning to spend the summer in New York with your favorite grandmother. You are excited to be in New York and with her when suddenly the inadvertent press of a button reveals a closet full of lingerie – certainly too many items to be personal. Continuing investigation exposes additional caches of filmy articles obviously for sale. Nana confesses that after retiring from her career with Maiden Form, she was bored and decided to go into business. The only industry she knows is lingerie so making a line of products for seniors was an obvious choice. As if her illegal sales from a rent controlled apartment weren’t enough, the plot continues with erroneously delivered packages. How could UPS possibly confuse packages from Saucy Lips with packages from Saucy Slips? Which company is Nana’s? Come to the Ice House and find out. The slip up (no pun intended) between Saucy Lips and Saucy Slips introduces Heather Van Dupree (Jenifer Bellin) to the hilarity. “She dreams of being a model. She sees an opportunity and goes for it,” says Bellin. Not much doubt what she’s interested in displaying! The cast is completed by landlord Gil Schmidt (Donny Graham) who wants Nana out of her rent controlled apartment and Clair (Robin Hoffman) who adds a bit of surprise at the end. Co-directors Belva and David Peden are new directors at the Ice House, but are veteran directors from community theatre in Oklahoma. The cast and directors agree that the play is a wonderful spoof full of fun and energy that will have you rolling in the aisles. By the end of the evening your sides will be aching. Come out and enjoy the gaiety. The Players are grateful to Season Sponsors: Family Healthcare Network, Graham & Associates, Lansdowne, Inc., and Martin Enterprises. Nana’s Naughty Knickers runs for three weekends at the Ice House Theatre at Race and Santa Fe in Visalia. Evening performances are at 7:30pm on 4/13, 4/14, 4/20, 4/21, 4/27, and 4/28, and matinees are at 2:00pm on 4/15, 4/22, and 4/29. To purchase tickets go to the Visalia Players’ website at www.visaliaplayers.org, their Facebook page “Visalia Community Players”, or call 734-3900.